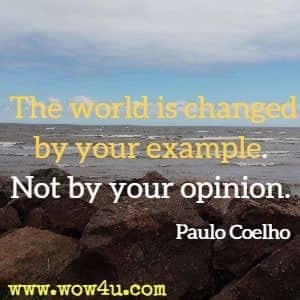 Be inspired and motivated by these Paulo Coelho quotes. He was born in Brazil. He has received numerous awards for his work as an lyricist and novelist. Be encouraged by his words of wisdom! Faith can exist without prayer, but prayer cannot exist without faith. If you want to be successful, you must respect one rule - Never lie to yourself. Don't waste your time with explanations, people only hear what they want to hear. Talent is a universal gift, but it takes a lot of courage to use it. Don't be afraid to be the best. Never give up. When your heart becomes tired, just walk with your legs - but move on. It is possible to avoid pain? Yes, but you'll never learn anything. Is it possible to know something without ever having experiencing it? Yes, but it will never truly be part of you. Everything tells me that I am about to make a wrong decision, but making mistakes is just part of life. What does the world want of me? Does it want me to take no risks, to go back to where I came from because I didn't have the courage to say "yes" to life? Don't allow your mind to tell your heart what to do. The mind gives up easily. You're always learning. The problem is, sometimes you stop and think you understand the world. This is not correct. The world is always moving. You never reach the point you can stop making an effort. It took me 40 years to write my first book. When I was a child, I was encouraged to go to school. I was not encouraged to follow the career of a writer because my parents thought that I was going to starve to death. Love like rain, can nourish from above, drenching couples with a soaking joy. But sometimes under the angry heat of life, love dries on the surface and must nourish from below, tending to its roots keeping itself alive. Haters are confused admirers who can't understand why everybody else likes you. 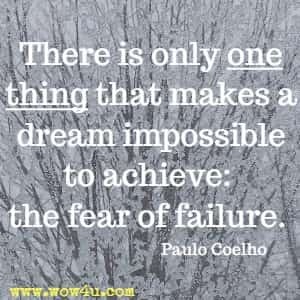 Go for the impossible. I always tried to find my own limits. So far I did not find them, so my universe is in constant expansion. Don't listen to the malicious comments of those friends who, never taking any risks themselves, can only see other people's failures. Life can seem short or life can seem long, depending on how you live it. A brush with death always helps us to live our lives better. All you have to do is pay attention: lessons always arrive when you are ready, and if you can read the signs, you will learn everything you need to know in order to take the next step. To become really good at anything, you have to practice and repeat, practice and repeat, until the technique becomes intuitive. I think that, with age, people come to realize that death is inevitable. And we need to learn to face it with serenity, wisdom and resignation. Don't be intimidated by other people's opinions. 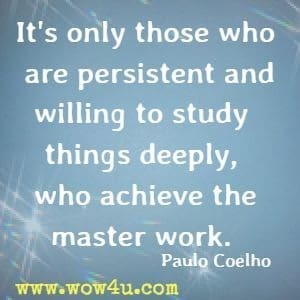 Only mediocrity is sure of itself, so take risks and do what you really want to do. Victories and defeats form part of everyone's life - everyone, that is, except cowards, as you call them, because they never lose or win. Music isn't just something that comforts or distracts us, it goes beyond that - it's an ideology. You can judge people by the kind of music they listen to. If you want to see a rainbow you have to learn to see the rain. 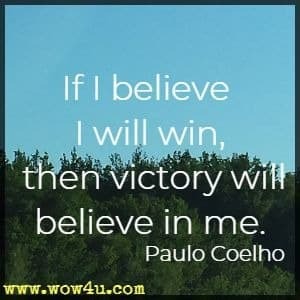 If I believe I will win, then victory will believe in me. When each day is the same as the next, it's because people fail to recognize the good things that happen in their lives every day that the sun rises.